Perfect crab cakes with no bread. Preheat oven to 400 °F (205 °C) and place parchment paper on baking pan well oiled (avocado or coconut oil). Whisk egg and mix all ingredients, using 1/3 cup of the flour (save the rest for dusting). Form into patties. Place on baking pan, drizzle with more oil or dot with butter. Cook 20-25 minutes till brown. Enjoy. Note: use homemade paleo mayonnaise. 61 members have added this recipe to their cookbook. I made a little sauce of Chipotle Mayo, mustard and lemon juice and drizzled on top- delish! These are great! My husband said he could have eaten the whole lot by himself. I made mayo from the Whole 30 cookbook and then turned it into a remoulade sauce. Yum yum! I didn't have the almond flour so I substituted in coconut flour. The peppers and onions provide a yummy crunch. 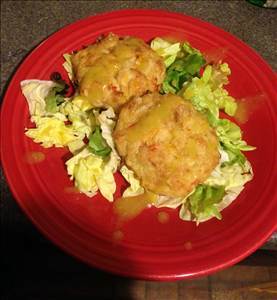 There are 156 calories in 1 serving of Paleo Crab Cakes. Calorie break-down: 51% fat, 18% carbs, 31% protein.